The provisional license exam ends and most of Class 1-A passes, however some powerful students are left looking in from the outside. While the students celebrate their success, villains lurk in the shadows. Shigaraki and his crew continue to scheme and wait for the right time to strike. Meanwhile, All Might has a tense one-on-one chat with All for One. While it’s surprising to see the likes of Todoroki and Bakugo fail, the way they failed isn’t surprising. Bakugo acted his usual annoyed self, while Todoroki had an unwelcome visit from his darker past. The way it’s presented feels like it’s supposed to land as a bit of a shock for viewers, although it doesn’t feel that way. What does come as a revelation is that one of the students from Shiketsu isn’t what they seem. It’s actually Toga in disguise, which explains the erratic behavior seen from this student. The plan that’s unveiled is pretty ingenious on their part. 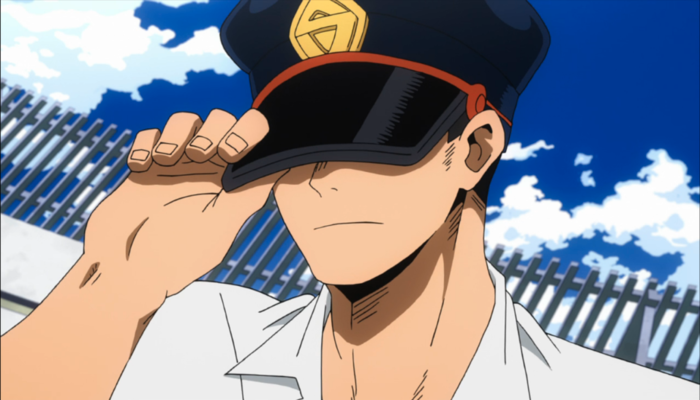 Although the question that lingers is what happened to that Shiketsu student. Are they OK? Did they just get disappeared never to be seen again? It’s pretty dark. After the focus being squarely on our heroes in training for so long it made it easy to forget about the villains. Their sudden appearance and watching how they easily achieved their goals without being detected come as a bit of a shock to the system. It’s an excellent way to re-introduce them back into the story line. Shigaraki isn’t the only villain making noise in this episode. All Might visits All for One at this maximum-security prison to try and get more information out of him. Although All for One seems far more confident and chipper for someone who can’t so much as breathe without having guns being pointed at him. It’s another bit of evil tacked on to the episode that makes it feel like the momentum will be swinging in the baddies’ direction. To wrap things up Deku has to deal with Bakugo, who’s having a hard time dealing with Deku surpassing him. This confrontation has been a long time coming, with plenty of hints being dropped along the way about Bakugo realizing Deku’s situation. It’s exciting to see them matchup after going through all of their training, and how Deku ends up resolving it should also be interesting. Episode 60 of My Hero Academia definitely takes the story in a darker direction. It’s well timed after the students have gotten some time to up their skills and shine as a positive force in this world. Now let’s see what the villains have got!